Thanksgiving can be a really stressful time for all of us. The baking, traveling, and tidying up can make you dizzy! One thing we shouldn't have to worry about is what we plan on wearing. Yet, every Thanksgiving I definitely do! You only get to see certain family members for these holidays--especially if they live far away. So you definitely don't want to show up in sweats! How you dress can greatly reflect how you are in life. Messy, eclectic, organized, etc. So here's a fool-proof guide I've created to help YOU find the perfect outfit for this Thanksgiving. 1) BE INSPIRED BY FALLS COLORS - Find pictures of Fall that inspire you. Notice the colors in them! When you are putting together your Thanksgiving outfit, keep these colors in mind. It helps a lot! 2) TYPE OF EVENT? - We all have different Thanksgivings. So you need to decide what category yours...and the outfits worn will fall under. Casual? Casually Dressy? or Dressy? This will help you decide if you need to even consider heels! 3) TONE IT DOWN! - Yes! Be inspired by Fall colors! But don't overdo it! Use dark browns and blacks to help balance your outfit, and keep you from looking too festive! Hopefully my outfits will help inspire your own! If you only like one or two pieces above, try incorporating them into your outfit! 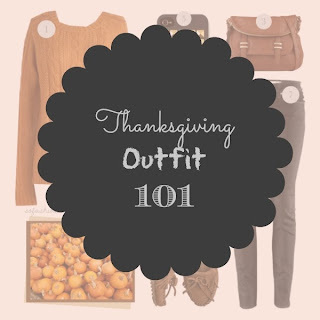 Please tweet your Thanksgiving outfits to me @SoFashionFrugal. I'd love to see them! Or follow me!